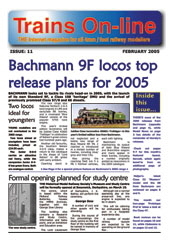 ALTHOUGH Trains Online magazine is not currently being produced a number of back issues are available on this page for visitors to download for free, including the very first from October 2003. They will shortly be joined by a quarterly book reviews magazine which may be download free from this site. The full range of back issues is available on the Trains Online Archive site. You will need a copy of Adobe Reader installed on your computer to read the magazine ... if you don’t already have it installed you can download a free copy by simply clicking on the logo below.